I’ve been busy starting back at uni for the last month or so, and I’ve built up a bazillion recipes to post on here. 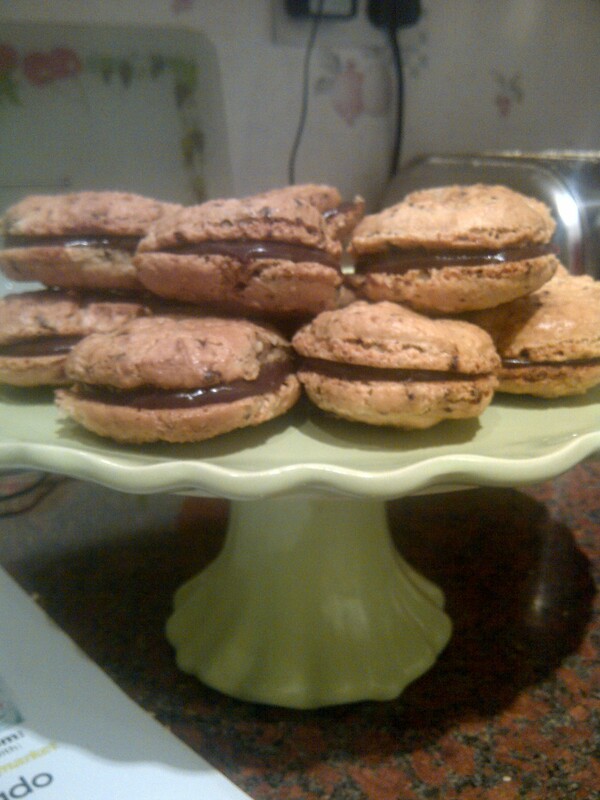 I’m going to start with the one I did today – coffee macarons with a chocolate ganache. I tried to make lemon macarons during the week, with a lemon curd filling, but it was an absolute disaster and the mixture was far too runny so I turned it into a lemony eton mess – it still tasted really nice but I was thoroughly disappointed with that attempt. So, I vowed not to be defeated, and made a second attempt today using a recipe from a website called Italian Food Forever….and…..*drum roll*…it WORKED! Granted they aren’t all perfectly matched round Parisian beauties, but it’s a serious improvement, and hopefully next time I’ll be able to make them a little neater. Grease and line two baking trays. You don’t need to preheat the oven at this point! Sieve the icing sugar into a mixing bowl, add the coffee and almonds and mix it all together. Pour egg whites into a separate, large mixing bowl and whisk until it’s foamy. Add the caster sugar then whisk like mad until they form stiff peaks (they should get to that point where on TV they always hold it upside down over their heads and it doesn’t fall out of the bowl – wouldn’t recommend trying it though). It’s much easier to use an electric whisk but if you’re poor like me and don’t have one, be prepared for an intense bicep workout! Fold the almond and sugar mixture into the egg whites – don’t go mad, just do it enough so that you can’t see unmixed bits of ground almond. Pour the mixture into an icing bag or, again, if you’re a poor student just use a sandwich bag and cut a tiny bit off the bottom corner to squeeze the mixture through. Squeeze out little circles of about 1 inch diameter, and space them out pretty well otherwise they’ll join up in the oven. Now you need to leave them for 20-30 minutes. This gives them time to develop a sort of stiff outer coat, and that stops them from cracking in the oven. At this point you can preheat the oven to 140 degrees C. Also, just tap the trays on the worktop a few times to expel the excess air from the biscuits. If you touch the top of the macaroons and they feel like they’ve got a firm film on top, and don’t stick to your finger, they’re about ready to go into the oven. Put them in for 15-20 minutes, or until they’re golden on top. Let them cool fully before taking them off the tray. Heat the cream in a pan until it’s almost boiling, then take it off the heat and add the chocolate and nutella. Stir it in until it’s all melted and there are no lumps. 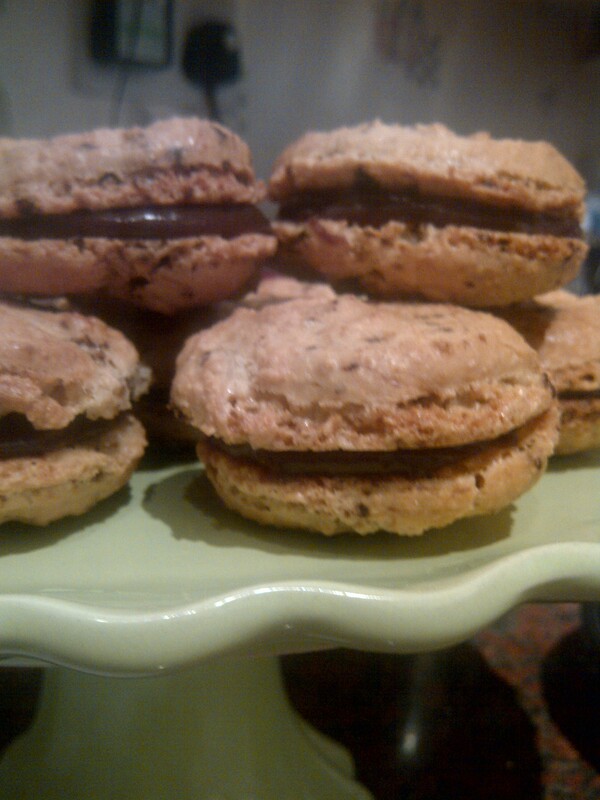 Leave it to set in the fridge for half an hour, then spread it in between the biscuits and make your macarons! It’s really pretty easy except for those egg whites which can be a right pain if they’re not setting! That was my problem the first time round. Just be really careful not to get any yolk in, and be prepared for some serious whisking effort. It’s worth it though, because they really are delicious!